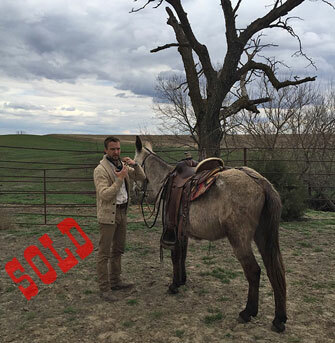 “#1“, a really gentle, 15/1, Belgian cross, 11 year old, mare mule. We are just finishing a 500 mile ride on the Cowboy Trail and she has packed boxes the whole way. 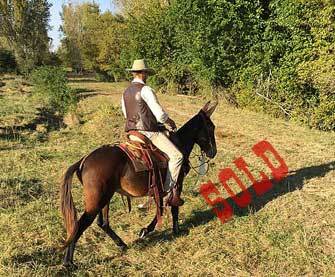 “Romeo“, he is the best made mule we have ever had, gentle, in your pocket, 14/3, 9 year old trail mule. Good to catch, load, trim and tack up. “Chip“, just a great, 15 hand, 12 year old, John mule. 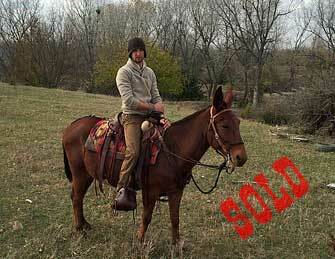 We have used him in our clinics, trail, checking cows, loaned him out, packed him, and much more. Just a dandy mule. “Asher“, a 15 hand, 7 year old, really nice John mule. 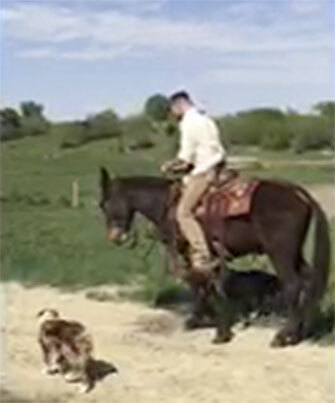 He is good on the trail and would excel as a show mule. This guy really moves nice. “Angus“, a really nice 8 yr old, 14/2 hd John mule. 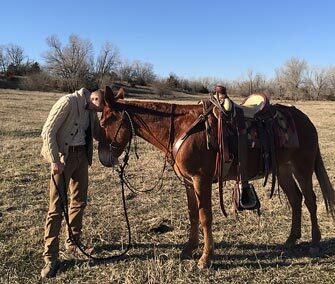 A good quiet trail mule that is good with cattle. “Trooper“, is a really GENTLE 8 year old, 15 hand, dapple gray, John Mule. This guy is tough, very gentle with no vices. 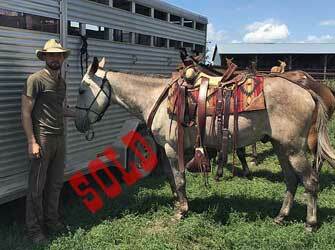 “Blondie“, is a 14/2 HD 8 year old Mare Mule that rides the very best. 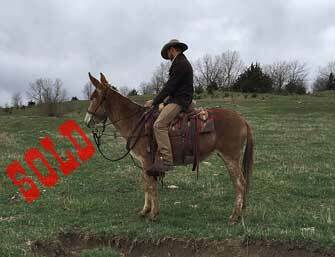 “Festus“, 12 year old 14/2 hand John Mule. 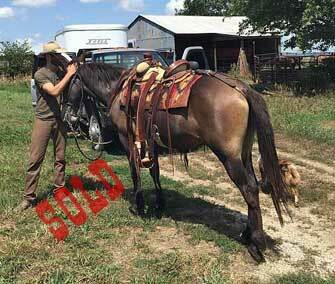 He is gentle, tough and great looking with a lot of trail, ranch and hunting miles on him. 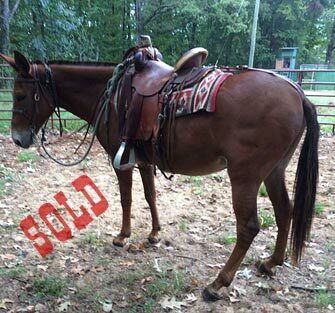 “Rose“, is a really gentle 14/3, 12 yr old mare mule that really rides calm. 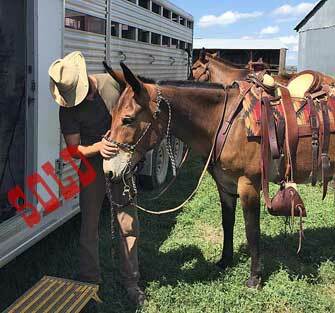 “Jocko“, is a 15hd, 14 year old mule that is as friendly as they come. 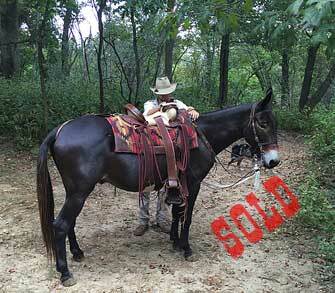 “Daisey“, really gentle 14/2 hd, 8 yr old mare mule that is great on the trail. 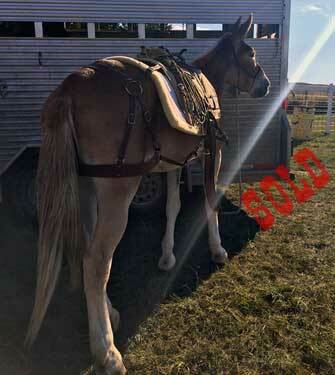 “Handy“, a nice 15hd mule going to CO. Sold before he could be listed.